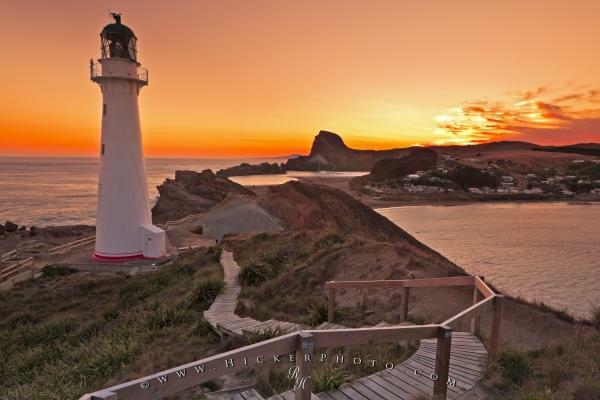 Standing from Castlepoint Lighthouse in New Zealand, the brilliant hues created by the sunset is a vision of beauty. Photo of a stunning sunset looking over the waters of Castlepoint in Wairarapa, New Zealand. Pictures from photo gallery "Lighthouse Pictures"
This picture is part of the photo album "Lighthouse Pictures" - there are more beautiful images waiting for you. ... A trip to Castlepoint is well worth the drive for anyone who has not had the chance to see this amazing countryside of New Zealand. A unique and tranquil place that will be well remembered on your vacation to New Zealand.Sunset at Castlepoint Lighthouse which overlooks the lagoon and bay, Castlepoint, Wairarapa, North Island, New Zealand. Here you find more Lighthouse pictures and photos, featuring lighthouses from several countries. I photographed this photo with the digital SLR camera model Canon EOS-1Ds Mark II, aperture of f/13.0, exposure time of 1/2 sec. on ISO 50, as always I used a original Canon Lens, the focus lenght for this picture was 24mm.